Since the age of Solomon, society has looked for righteousness in matters large and small at the hands of learned and impartial judges. That trusted position has been a lynchpin of dramatic cinema. With so many stories set in and around the courtroom, a movie featuring a jurist has to do a lot to stand out. 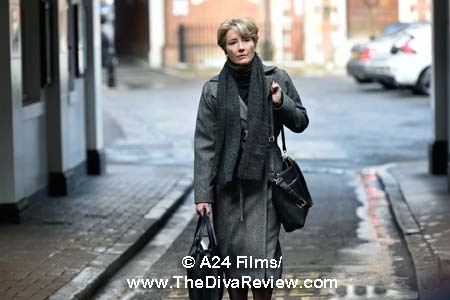 Based on the novel by Ian McEwan, Director Richard Eyre’s THE CHILDREN ACT very much does so by virtue of its unusual premise and a mesmerisingly powerful performance by Emma Thompson at its centre. As a High Court family law judge, Fiona Maye’s life is about balance; whether it’s the scales of justice under which she serves, her balance of the law versus human emotion, or the heavy demands of her work against the normalcies of married life. The judge is renowned for her brisk court conduct and clear-eyed and precise rulings. It is a surprise then, that Fiona takes a step far beyond expectation during a case of a sick minor. The seventeen-year-old boy just months from adulthood is dying. He is in hospital, in desperate need of a blood transfusion that has every chance to save his life. Young Adam and his parents are devout Jehovah’s Witnesses, and any transference of blood is a mortal sin. To their faith, to die of the leukemia ravaging the boy’s body is preferable to the eternal damnation he will face in the afterlife if he undergoes the procedure. As Adam is so close to being legally able to decide the matter for himself, Fiona decides to travel to his hospital and see the young man, as both the prosecution, seeking the transfusion, and the family’s defence agree that Adam is a boy like no other. Rail-thin and luminously pale, Adam greets the expected judge with a light in his eyes that seems almost manic in his excitement that a person of Fiona’s status would personally visit and ask about his care. Adam answers all of Fiona’s questions like the devoted acolyte of the Watchtower he was raised to be. It is only when Fiona hands him the guitar that seems to be the boy’s only entertainment while hooked up to life-saving machines, that his fervor slips even a notch, as Fiona, also a music lover, encourages his playing. Fiona decides that although his time as a minor is short, the law is clear that Adam’s life must be saved, and so the transfusion goes through, as the boy and his parents tearfully look on. Whilst in the middle of this life-saving determination, it is Fiona’s home life that is failing, as her college professor husband has announced that he intends to have an affair with a student. Her devastation is placed in small, tight compartments, as, true to Fiona’s character, she remains all business on the bench. Dreading to return home to an empty flat, sinking into Adam’s case serves as a catharsis and escape that allows her to deflect her pain. Indeed, months later, Fiona is getting on with things, when Adam, the young man she saved, suddenly stands before her. He is awkward and incoherent about just what he’s doing; clearly having tracked her down. His puppyish adoration is evident, even if he cannot verbalise it. Fiona is perfectly level-headed and understanding, even as she tells the boy to go on and live his life as well as he can, without looking back. 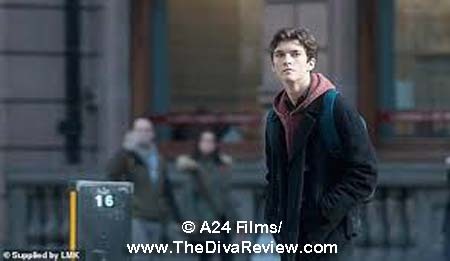 It’s hard advice for Adam, who continues to follow her movements; eventually begging her to let him live with her. Adam goes one stalk too far, and Fiona firmly dismisses him. 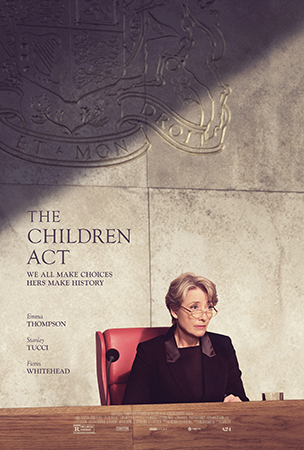 THE CHILDREN ACT is a tour de force by its star, Emma Thompson. She shows us a series of beautifully rendered fragments of nuance, tenderness, emotion, and strength in a performance so taut and breathtaking, it was like watching a ballet dancer on a tightrope. Fiona never forgets that at her core, she is simply a person who wants to help children. Her steely, disciplined bench appearances are never without heart or consideration for the families she’s affecting. The scene when she renders Adam’s verdict is like a breath released one didn’t know they were holding, for both the audience and Fiona, as we see her surety that there was a indeed a legal way to keep the very special boy who seemed to shine from inside, alive. We feel heart-wrenching tightness unto bursting watching Fiona go on every day in a profession where emotion cannot abide, knowing that her lifelong love has betrayed her. Carefully, Thompson weaves the inescapable frisson of attraction at Adam’s ardent attention at the time Fiona felt most lonely and unloved, as well as the secret considerations, and the inevitable regrets. 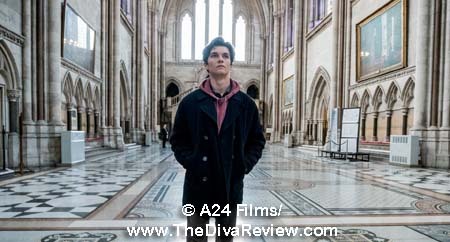 That chemistry is created with Fionn Whitehead as the young man prepared to die for his faith. When we first meet the moptopped youth, he has the glowing eyes and wild grin of a zealot, and the hyperactive demeanor of a child, or someone on a lot of drugs -- of which Adam is both. In his purity when fiercely defending his beliefs, or the joy when playing a duet with Fiona, he resembles a gaunt, pre-adult version of a Raphael angel. Strangely, his Adam seemed more sure and steady in the grip of death, than once he’s up and living a normal life again. We understand his pull toward Fiona as part superhero, part mother, and the desperate, all-encompassing crush of a sheltered teen whose life she had literally saved. Neither do we understand what he thinks any self-respecting person who had no clue their spouse was considering straying is supposed to do when faced with such a betrayal? Did he expect her to accept his sleeping around? It is a moment that displays the difference between British and American manners that Jack somehow lived to walk out the door on his own power. Bad enough our heroine must reel from a gut punch right off the bat, but after Jack comes crawling back, literally days later -- ostensibly rejected by his new chippy – that he expects not only to be let into their flat, but is disappointed Fiona won’t allow him into their bedroom, bears incredulity. As the story goes on, and the pressure of what to do about Adam rises, Jack slowly worms his way back into Fiona’s life, simply by hanging around like a remora when she’s at her lowest (Second lowest, perhaps, after her man declaring he’s dumping her for a college coed.). It was very unsatisfying to see this brilliant woman “rewarded” with the return of this cheating louse, and while I venture it was meant to imply that Fiona was not made of steel, and that a strong marriage can go on even in the face of such blatant perfidy; the ease of his return was an insult to Fiona’s character. The one benefit of that smarmy development is a too-little told lesson of finding an anchor of sanity and self in work one loves, and refusing to let anyone take it away. Fiona’s service as a judge isn’t a career, as much as a calling that she devotes herself to unquestioningly. THE CHILDREN ACT is a masterful study of intricate nuances of passion and abstention. A delicate and compelling exploration of the heartbreak of chances not taken, and kindred souls that can never truly meet. Embrace this film for the joy of a perfect Emma Thompson performance.